H istorically, Hong Kong is one of the most important centres for traditional Chinese martial arts and, since the mid-20th century, the de facto capital for Kung Fu films. The interaction between Kung Fu as a physical practice and mass media since the 1950s is a defining characteristic not only of Hong Kong culture, but it played a key role in forging a transnational Chinese identity and engendering a global fascination with Chinese martial arts. In this process, Kung Fu was elevated into one of the most powerful and recognizable symbols for Chinese culture. In turn, media – and, in particular, film – representations came to dominate our perception of Chinese martial arts, and had a significant impact on the development of Chinese martial arts over the past 60 years or so. The interactions between the practice and media representations of Kung Fu are complex and multi-layered. 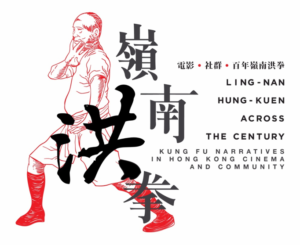 The ” Lingnan Hung Kuen Across the Century: Kung Fu Narratives in Cinema and Community” exhibition is a portal to observe Kung Fu’s dual aspects as physical culture and inspiration/ subject-matter for media and film. Using Hung Kuen, one of the most important and enduring Chinese martial art systems with over a hundred years of history in Hong Kong, as a focal point of the exhibition, visitors will follow the parallel history of two of the most influential martial art families in Hong Kong – Lam Sai-wing 林世榮and his descendants on the one hand, who have played a critical role in modernizing and systematizing traditional martial arts in South China, and are responsible for creating one of the first truly globalized Kung Fu systems; and Liu Zhan劉湛and his lineage (including his son, the actor and director, the late Lau Kar-leung, aka Liu Chia-liang劉家良) on the other, whose contribution and impact on Kung Fu cinema remained unexcelled with the exception, perhaps, of Bruce Lee – to investigate how the development of Kung Fu as practice and media criss-cross and influence each other. Throughout the exhibition, visitors will find themselves comparing the Lam and Lau families in a diachronic manner and by the end of the exhibition, coming to a realisation of how Kung Fu practice and media representations converged with the birth of mass media in Hong Kong in the early 20th century, even continued to fuel and influence each other’s development through the “golden age of Kung Fu” in the 1970s up to the mid-1980s. An ample collection of digital stimulations and 3D visualization, including animation of the late master Lam Sai Wing and 3D adaptation of selected scenes from Lau Kar Leung’s Kung Fu Classics, will also help visitors to better understand the essence of Kung Fu. The event will be cancelled without piror notice. I, the undersigned, am medically and physically fit and capable of participating in this event. I confirm and agree that I take part in this event entirely at my own risk and responsibility. I will take the responsibility for death or any injury or for any damage to or loss or destruction of property or any other economic loss or for any consequential loss, in any such case arising from any accident or mishap or otherwise arising from or connected with this event, including, during or after this event, travelling to or from it or otherwise.